Throughout my time and experience with multiple companies, I have come to find out that in order to be data-driven, there are several layers of data needs to be successful. As shown above, there are 4 key areas to data needs. This is the base level to any data needs. If you don't have core data and are not storing it, then you cannot have data pulls. Data pulls I categorize as literally a dump of the raw data. This is often shared in spreadsheets and text files. This is where there are files with thousands of rows with a wide list of columns. These data pulls are critical and often many people fall back to this to answer specific questions. If a self-service tool can be built to simplify the data pulls, this layer is something that can be delivered to the masses. I often categorize products as a specific delivery of a data question. This is often how Business Intelligence teams function. There is often where teams meet with business partners, identify and document requirements, build a specific dashboard/report based on that needs. An example would be where a team would deliver a Sales Analysis report to the director of Sales. Often there are reports (aka products) that are grouped together to deliver on the specific set of business questions. This is the next level of deliverables. Instead of having your business partner to pull their own data or deliver on a specific question, eventually there are too many "products" to focus on. This is where alerts come into play. 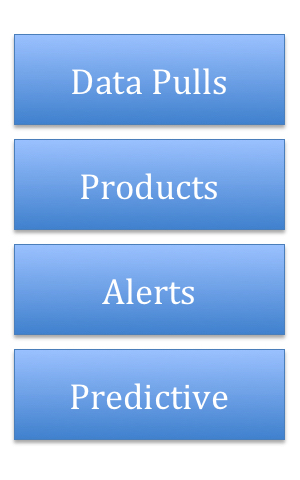 Instead of focusing on so many individual products, now alerts can notify when something is good or bad. This helps optimize time for those who use the data. Instead of looking at all the "products" or all the data, they can rather focus on areas that are outperforming. An example could be to show what departments are selling at less then 2 standard deviations from the average sales for the past month. Now instead of looking at over 100 departments, you may get alerted on 2 departments. The last level of data needs is focused on predictive. This is an expansion on the "alerts" section. 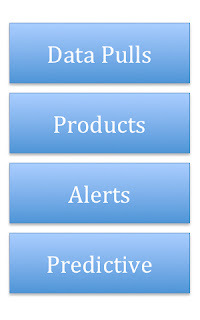 This allows the data consumer to be notified prior to bad or good alerts. These predictive products can be based on models from prior history or even other types of models. This changes the behavior from being reactive (focused on the prior 3 levels) to being proactive and being data driven. These levels and deliverables can be applied to any industry. Whether this is sales, web analytics, inventory, or another type of data these types of data needs are critical in order to be data driven. Hopefully you find this helpful. Please feel free to leave comments and thoughts below. Love what you're doing here and completely agree with your four main components. The challenge will be for organizations to spend less time on the former and more time on the latter. Thanks DB. The idea is to enable as an organization from one level to the next. Once you enable one level you can spend more time on the next!